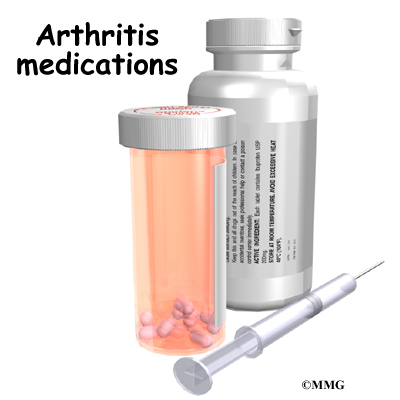 Doctors have only a few kinds of drugs to help treat the many different kinds of arthritis. The three classes of drugs doctors prescribe are nonsteroidal anti-inflammatory drugs (NSAIDs), corticosteroids, and disease-modifying antirheumatic drugs (DMARDs). The most commonly used drugs are NSAIDs. The over-the-counter drugs aspirin, ibuprofen, and naproxen are NSAIDs. Your doctor must write a prescription for other NSAIDs. Almost all of the NSAIDs are taken in pill form. Your doctor will probably prescribe only one form of NSAID at a time. Inflammation is your body's response to an injury. In normal circumstances, inflammation is the process that helps the injury heal. In arthritis, the inflammatory response gets out of control and actually causes damage to the tissues. NSAIDs help reduce inflammation. They also decrease pain and fever. However, they are short-acting drugs. After NSAIDs have passed through your body, inflammation, pain, and fever can return quickly. NSAIDs can be very effective against inflammation, but they do not prevent tissue damage. Even when NSAIDs are controlling the inflammation, the joint or organ damage of arthritis can continue to get worse. NSAIDs only lessen your pain and discomfort. They do not affect your underlying disease. NSAIDs are safe drugs. However, they have many side effects. The side effects happen more often when they are used over long periods of time, which is common in arthritis patients. Some of the side effects can become very serious. It is important to use the lowest doses possible to control your symptoms. NSAIDs irritate the gastrointestinal (GI) tract (the digestive system--your esophagus, stomach, and intestines). They increase the production of gastric acid, and they harm the gastric lining. NSAIDs aggravate ulcers and GI bleeding. Up to 5 percent of people who use NSAIDs for a year develop ulcers, bleeding, or tears in the GI tract. The risks are higher for older patients, patients with a history of GI problems, and patients with heart disease. NSAIDs make it harder for the platelets in your blood to clump together at the site of an injury. This can cause bleeding problems. Aspirin especially has this effect. Before you have surgery, you should stop taking aspirin for two weeks to prevent bleeding problems. NSAIDs can be toxic to your liver. You will not feel this, but elevated levels of certain liver enzymes can easily be seen in blood tests. Liver function almost always returns to normal when you stop taking NSAIDs. NSAIDs can make it hard for your kidneys to get rid of some kinds of wastes. If you have a history of kidney problems, or if your disease may affect your kidneys, your doctor will use NSAIDs with caution. Some people get skin reactions and rashes from NSAIDs. Some get a combination of runny nose, polyps in the nose, and asthma. Different kinds of NSAIDs can have different side effects. Salicylates can cause problems with hearing. Other kinds of NSAIDs can cause headaches and confusion, especially in elderly patients. Many of the possible side effects depend on your health and the disease for which you are being treated. Individuals can react very differently to the same NSAIDs. You and your doctor must work together to find the type and dose of NSAID that controls your symptoms without causing unwanted side effects. Corticosteroids are chemical copies of hormones that occur naturally in your body. The most commonly used corticosteroids are prednisone, prednisolone, and methylprednisolone. Corticosteroids can be given orally or put directly into the bloodstream through an intravenous needle. They can also be injected directly into an inflamed spot. Corticosteroid cream can be rubbed on the skin. Corticosteroids are powerful drugs. They drastically decrease inflammation. But they are also highly toxic. Doctors have different opinions about how corticosteroids should be used. Corticosteroids can't cure your disease. But they do seem to affect the development of some diseases, including rheumatoid arthritis (RA). Corticosteroids can have many unwanted effects on your body. Whether or not you develop these complications depends on many factors: what type of corticosteroid you take, your dose, the length of time you are on it, and how sensitive your body is to these hormones. The most common side effects are. All corticosteroids slow bone growth and create conditions that lead to osteoporosis, a disease process that results in reduction of bone mass. Compression fractures of the vertebrae can happen with long-term corticosteroid use. Men and women past menopause are most likely to develop osteoporosis. Your doctor may recommend that you take calcium and vitamin D pills while you take corticosteroids. High levels of corticosteroids hinder your body's ability to fight bacterial infections. High-dose corticosteroids can even mask the symptoms of some types of infections, such as abscesses and bowel tears. Most viral infections are not a problem, except for herpes. This means that your pituitary and adrenal glands can't produce enough of certain kinds of hormones. This can happen after taking corticosteroids in moderate doses for only a few days. Adrenal insufficiency is most likely to happen as you are reducing the dosage. It can be a problem if you need surgery or if you get an infection or serious injury. When you stop taking corticosteroids, the doses will be slowly reduced over a period of days or weeks. Even if you have only been taking steroids for a few weeks, you will still need to taper off. Corticosteroid withdrawal can be very difficult for your body. In many patients, the disease symptoms become worse. Some people experience a sickness that includes fevers, nausea, vomiting, low blood pressure, and low blood sugar. Others have withdrawal symptoms that include muscle and joint pain, weight loss, fever, and headaches. If you have problems coming off corticosteroids, your doctor will have you taper off the drug more slowly. Different people, and different diseases, react very differently to corticosteroids. You and your doctor will need to find a dose that controls your symptoms but minimizes unwanted effects. DMARDs are primarily used to treat rheumatoid arthritis (RA) and other systemic diseases. In the past twenty years, DMARDs (which are also called slow-acting antirheumatic drugs) have become much more widely used. The idea behind using DMARDs is to prevent joint damage. This means you start using them early on, and you switch drugs or doses when your current drugs stop working. Using DMARDs requires you to be alert for possible side effects. You also need to be patient. DMARDs take some time to work. But they can be very effective at slowing the course of your disease. DMARDs do not cure disease. Very few patients see their disease go into a complete remission. Most patients find that their symptoms come back after months, or sometimes years, of improvement on DMARDs. Doctors often prescribe DMARDs, corticosteroids, and NSAIDs at the same time. The DMARDs affect the underlying disease, and the corticosteroids and NSAIDs give relief from pain and inflammation. Sometimes doctors prescribe two or more DMARDs together. There are few studies to prove how well these combinations work. However, using more than one DMARD does not seem to cause problems with higher toxicity. This means that taking more than one DMARD isn't any harder on your body than taking just one. There are many different types of DMARDs, with different effects and complications. Some are used only for specific types of diseases. Hydroxychloroquine and chloroquine have been used since the 1950s for rheumatic diseases. They have been used against malaria for much longer. These drugs are mostly used for RA and lupus (which is also called SLE). Chloroquine has more side effects. Side effects include indigestion, rash, and eye problems. Antimalarial drugs take three to four months to show results. This drug affects the way your immune system functions. Almost 25 percent of patients who take it experience bad side effects within the first year. The most common side effects are rashes, blood and protein in the urine, low numbers of platelets in the blood, and autoimmune problems including drug-induced lupus. Taking penicillamine requires regular blood and urine tests. This fairly new drug is used primarily in RA and spondyloarthropathies (arthritis of the spine). It may slow down erosions of bone. Almost half of patients develop side effects in the first four months, but most of the reactions are minor. Side effects include rashes, nausea, abdominal pain, liver and blood disorders, low sperm counts, and discolored urine and sweat. You will need liver and blood tests for the first months on this drug. Gold compounds have been used for eighty years to treat RA. They are also used in juvenile chronic arthritis and psoriatic arthritis. Gold is injected into your muscles, usually once a week. Most patients only use gold compounds for one to five years. After about a year, most patients stop seeing benefits from using gold therapy. And most patients also start having complications. Unwanted side effects include diarrhea, rashes, low levels of platelets and other blood disorders, protein in the urine, lung problems, and sores of the mucous membranes, especially in the mouth. Using gold compounds requires regular blood and urine tests. Methotrexate shows results in one to two months. Most patients stay on it longer than other DMARDs. In the short term, methotrexate causes nausea, loss of appetite, and high levels of certain liver enzymes. As with all the other DMARDs, there are serious complications with long-term use. It can cause liver damage and lung disease. This drug is most often used in RA, lupus, and other connective tissue diseases. It can also help offset the bad effects of steroids. Azathioprine is as effective as other DMARDs, but it does have more side effects. It can cause nausea, vomiting, diarrhea, bone marrow suppression, and hepatitis. The most troubling long-term side effect is cancer of the lymph system. Chlorambucil and cyclophosphamide are the main alkylating agents used as DMARDs. Chlorambucil is usually used to treat RA, juvenile chronic arthritis, vasculitis, systemic sclerosis, and ankylosing spondylitis. However, it can damage the chromosomes. This creates a higher risk for leukemia and other kinds of cancers. Cyclophosphamide can be taken by mouth or intravenously. It is usually used to treat severe RA, lupus, and systemic vasculitis. Bad side effects are common. They include inflammation and bleeding of the ulcer, suppression of the immune system, reproductive problems in men and women, and cancer that may show up long after the drug is stopped. Cyclosporine can be very effective against RA, but most people who take it develop kidney problems and high blood pressure. Kidney function goes back to normal when you stop taking the drug. As with NSAIDs and corticosteroids, you and your doctor will need to work together to find the best type and dose of DMARDs for your disease. Oral medications (pills taken by mouth) are under investigation that might be available in the future for the treatment of a specific type of arthritis called psoriatic arthritis (PsA). These include ustekinumab, apremilast, and tofacitinib. Each of these medications works in a slightly different way to regulate the immune system.